A language can have local variations when used in different countries. 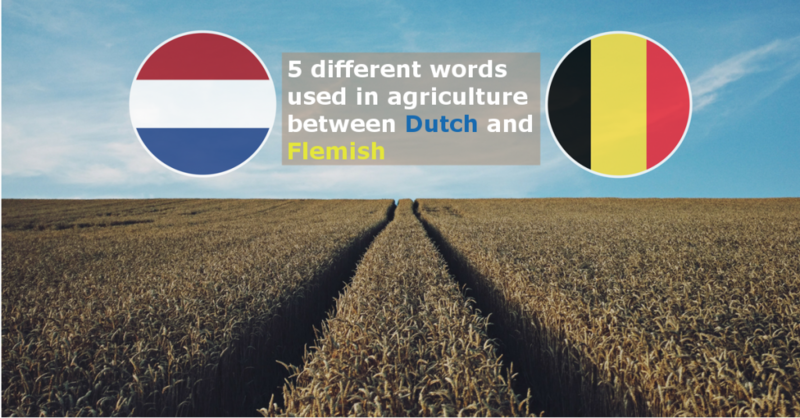 In Dutch some words differ between the Netherlands and Flanders, in the North of Belgium. People living in the Netherlands and those in the North of Belgium (Flanders region) all officially speak the Dutch language. This language acquired in the 16th and 17th centuries the characteristics it still has today. The original Germanic case system, still present in Middle Dutch, disappeared after the 16th century. In this respect Dutch resembles English. Why is Dutch slightly different in both countries? The Dutch language evolved however in the two countries. In the Netherlands more and more words are picked up from English, as is the accent when speaking. In Belgium many words were adapted from the French language, and sounds like sharper spoken Dutch. This is because French and Dutch are both official languages in Belgium and they are mixed to express similar ideas in a similar environment. Some examples of French influence in Flemish. The grower or landbouwer cultivates his land in Belgium, whereas the farmer is the agrariër will do the same in Holland. Another example, if the farmer offers you a cup of coffee, it will be a tas koffie in Flemish. The word tas comes from the French word tasse for cup. In Holland, you will drink a kopje koffie. Hopefully, they both asked their agricultural advisor, the technieker in Flanders and technicus in Holland some advice about the use of a plant protection product or gewasbeschermingsmiddel in both cases. When planting onions he Belgian farmer plants ajuin and the Dutch one plants uien. The notion of marketing authorisation or product registration is an issue, especially in a translation that has to target both communities at the same time, as we are often asked to do. In Holland, they use toelating which means authorisation and is also understood in Belgium. A product needs a specific registration to be marketed like pesticides or pharmaceuticals. They must have an erkenning which is a stronger word than just an autorisation : rather an accreditation. The principle of wederzĳdse erkenning has nowadays been established as a common term for both countries when it comes to mutual recognition. Empty packaging should be disposed of at a waste collection point. In Belgium, such a place is called a containerpark. It reffers to the specific heavy duty swaged containers it contains for each specific waste purpose. In Holland, altough the premises would have a very similar design, the term milieupark is more commonly used, referring to the ‘milieu’, Dutch word for environment. As we see, a language can vary according to the country where it is used. It is essential to know where a document to translate will be used and adapt (it’s also called ‘localise’) the translation accordingly. If product labels or market research surveys don’t take these differences into account, it might not be correctly understood by the target audience. Agrooh is a translation agency specialised in Bioscience.